Everyone loves a fashion brand, which can be driven by either a person or an entity. So, H&M or a Top Shop, versus a couture house that is headed by a designer is also ‘a brand’ in themselves. The difference between the mass market brand, is they often “add” the personality of a “fashion designer” who is also a brand, to give their own un-branded platform a ‘branded’ personality. A personality (also a “brand” or “company” in themselves) walks the fine line between being both an entity, a person, a personality, and finally, a brand. Totally confused? Sometimes, the world of branding is like stepping into a fun-house of mirrors that reflect and de-flect off each other. There is a way to get through the fun house, but you can often end up at several dead-ends in the process and even, get lost entirely. John Galiano got lost; his personality, brand and company were fused together in a disturbing and almost maniacal way, that could only lead to disaster. The man, had become the work, the work, had overtaken the man and there was no separation between the two. Never mind the set of circumstances (they were certainly serious) the point is that when a ‘personal brand’ gets lost in translation dangerous things can happen. The invitation by Oscar De La Renta to Galiano to collaborate, or, to be in residence this past summer, had everyone on watch in the fashion world. I saw something different. I saw the well established house, reaching out to a genius, and a design collaboration beginning that might end up being one of the most unique in recent fashion history. 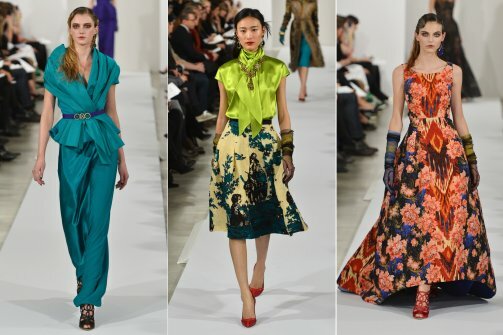 Witnessing the collection myself, for Fall 2013, I saw how seamlessly and effortlessly the traditions of Oscar De La Renta, always restrained and elegant, rippled out over the edges and became something much more interesting. A bit of danger, and some genius, if you will, had been added to the mix. This collaboration is an interesting infusion of brands and personality and worth watching from a brand perspective as to how it will unfold. From a design standpoint, there was a cross-pollination of traditional couture in combination with a very edgy, opulence of Galiano’s influences which was almost seamless. This meant that both of the designers were able to collaborate, not dominate. Each was influenced by the other, and a very fresh and optimistic result occurred that was noticed by the fashion press. On our end, our review of the brand collaboration continues. We can’t wait. Editor’s Note: I met Monsieur Galiano in a restaurant in Paris, as I was dining right next to him with a friend who recognized him and extended his hand as a fellow designer. M. Galiano was very polite, quietly enjoying his dinner with a friend, his beloved pet dog, on a leash below the table. I wished him well, and I am happy to report his recovery, here. While his actions may have been inexcusable, the disease of alcoholism was rarely mentioned by the press. Sadly, this worldwide epidemic, continues to remain in the shadows, even when its evidence is in plain sight.